Ah, basketball. One of the sports that took a big part of my life because I was a part of my school basketball's team. I love to play any type of sports, just name it, swimming, tennis, golf but basketball is still my favorite sport. Perhaps that is why I often dress up really sporty. I immediately bought this dress when I spotted it in Topshop. I also love to wear thigh high socks because it gives me a sporty look and I think it is a perfect combination for this dress. Completed my look with a pair of Nike shoes, Adidas cap and, of course, accessories. I love your quirky style! omg this is just gorgeous. This outfit is so cute. I love the dress and the clutch bag. It would look great with heels to! what a compination! wouldnt come across my mind! got inspired! whoa, gorgeous. i don't think i could ever pull off such an edgy sporty look! Woah girl you're stunning! I'm followig you now =) love! omg you look stunning, girl! STUNNING! love your style and the pictures looks so good! 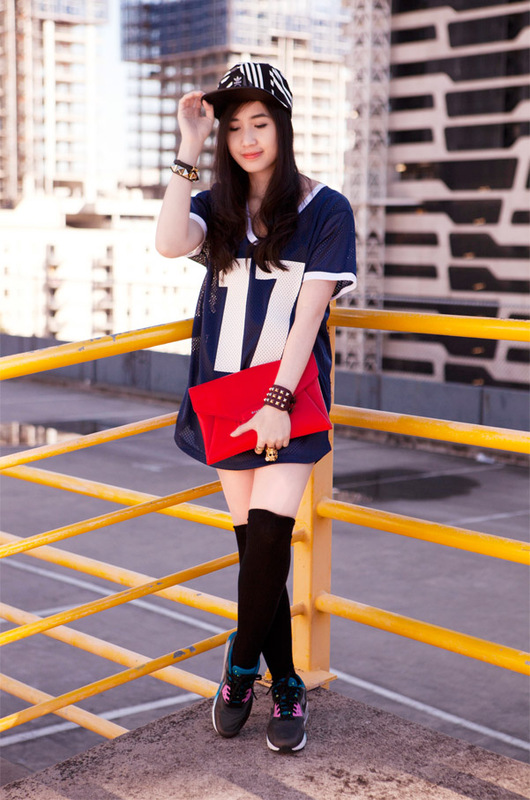 Love your sporty look with the bold clutch! Super gorgeous outfit, love love love your Givenchy bag!